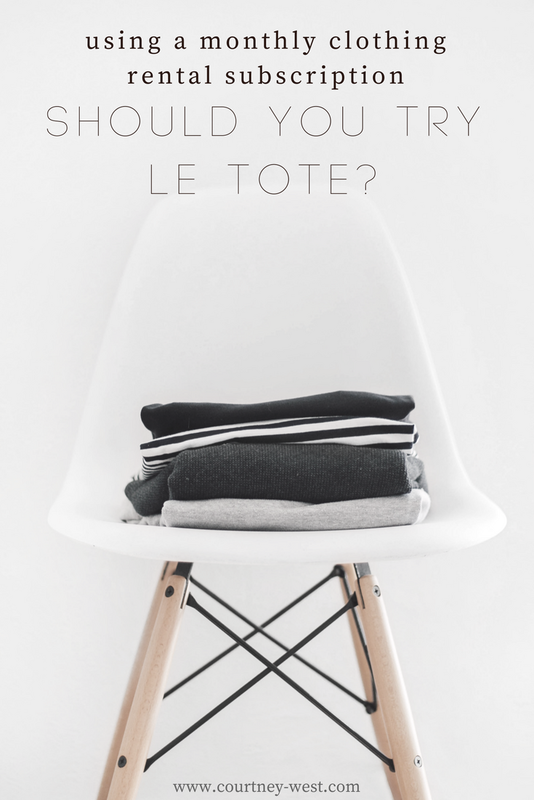 If you're a female between the ages of 18 and 45, I'm sure you've seen ads for Le Tote pop up on your Facebook, Instagram or Pinterest feeds in the past two years. I certainly did! Despite seeing all of the ads and being somewhat interested, I wasn't completely sold on renting everyday clothing. But one night while chatting with my friend Mary, I complimented a top she was wearing and she told me it was a rental from Le Tote. I immediately signed up the next day to get my first tote, and I haven't looked back since then! 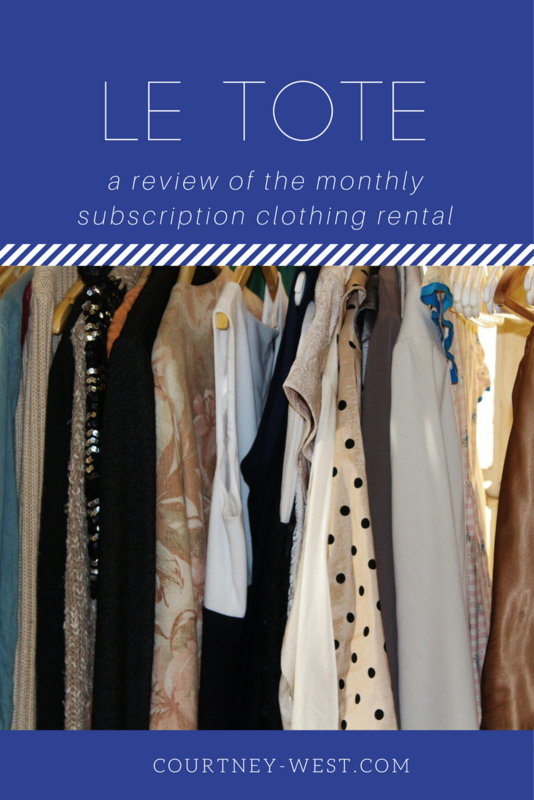 I describe Le Tote as a mashup between Stitch Fix and Rent the Runway (full disclosure: I have personally never used Stitch Fix). The clothing is rented (a la RtR) but more casual in nature and it's chosen based on style profiles (a la Stitch Fix). The brands are what I call "Nordstrom brands" - items that you could easily walk into Nordstrom and find. How does it work? First, you fill out a style profile on Le Tote's website. Next, items are picked for you and added to your tote. You have 48 hours to confirm the choices as is or swap them out if you aren't happy with what was chosen for you. Once shipped, the clothing and accessories arrive at your doorstep within 2 to 3 days. You wear the clothing and accessories, get lots of compliments, put them in the provided and pre-paid return bag, send back to Le Tote and start all over again! What does it cost? My plan is $39/month and I receive two clothing items and an accessory. There are other plans, including a maternity Tote! Are the clothes gross? Not at all! All of my clothing has always arrived nicely folded and wrapped in tissue paper. The jewelry and accessories arrive in a small bag, usually tucked between the clothing items. My sister once received a shirt that was so wrinkled it was beyond wearable out of the box and a quick e-mail to customer service got it straightened out right away - she received a free clothing item in her next tote. Do I have to wash them? Nope! Le Tote provides a prepaid return shipping bag in each box and you just pop the worn clothing and accessories into the bag and send it back! Le Tote takes care of all of cleaning when the clothing arrives back at the warehouse. How long does it take to get the clothing? When I drop my pre-paid returns at the post office, I usually have an e-mail from Le Tote within 2 hours telling me my next tote is ready and I need to check in the app/online to confirm it. If I want to swap something out, this is when I do it. If I confirm the same day, my clothing usually arrives within two days. I typically receive three or four totes each month. Can I keep the clothes if I like them? Yep! And I have! If you purchase all of the clothing in your Tote, you receive a month free. I've had some dresses and sweaters that I liked so much I purchased them to keep forever and it's been worth it. What are my favorite pieces? I have a cardigan by Summer & Sage that I purchased from Le Tote and wear at least once per week, as well as a maxi dress by Max Studio, a dress from Catherine Malandrino, and two dress shirts from Vince Camuto. 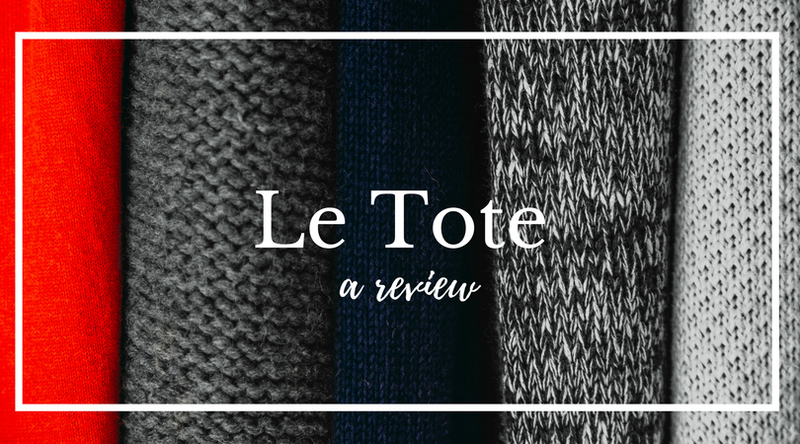 Overall, I'm so glad my friend Mary introduced me to Le Tote nearly two years ago. The subscription is well worth the $39 monthly fee, as I now have a seemingly unending closet for work and frequently receive compliments on "my" new clothes. PS - This post is in no way sponsored by Le Tote and I was not compensated in any way. I just wanted to share my love for my current favorite subscription box! However, if you are interested in joining, my affiliate link will give you your first tote free. You can check it out [here]. Happy Monday, everyone! I'm excited going in to this week because I have a short work week! I'm traveling to California on Thursday for a Junior League leadership conference and I can't wait. Warmer weather, meeting new friends, lots of learning and my hotel is across the street from the beach. I wanted to use this weekend to prep for my trip and get a bunch of items crossed off of my to-do list, but that didn't happen. Friday night was spent working from home. I get overwhelmed at the thought of all of the e-mails, phone calls, and work that comes rolling in while I'm out of the office, so I wanted to start this week with a clean slate so I don't get too far behind while I'm traveling. Saturday brought the absolute laziest day I've had in a very long time. I spent most of it on the couch with a weird sinus headache that made me feel like I had a massive hangover, despite the fact I hadn't had a drop of alcohol to drink on Friday. I had no motivation to do anything, so I scrolled Pinterest, napped, and threw a frozen pizza in the oven for dinner and called it a day. Sunday was a busy day that involved lots of food! I met a friend for brunch to discuss some upcoming Junior League events. Our League will be celebrating its 90th Anniversary in 2019, so we are getting a head start on all of the planning. It was so lovely to chat about ideas over a savory waffle with eggs, cheese and sausage (no whole 30 here!). Of course, no Sunday in January is complete without watching football and eating like a maniac. 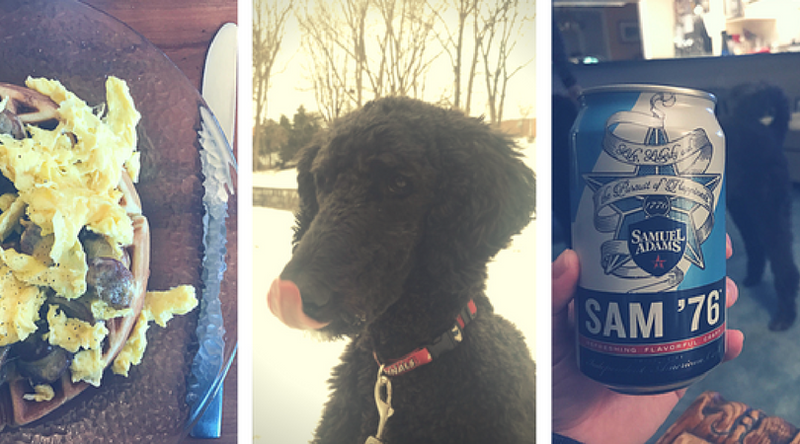 Jason and I spent the afternoon at my parents house, where we made macaroni and cheese, brisket, spinach and artichoke dip and washed it all down with cold beer. But those games! They both broke my heart a little bit. Well, as much as a heart can break for two teams that I don't have much interest in at this point. I so wanted Jacksonville to win only because one of my favorite former Penn Staters Paul Posluszny plays for the Jaguars. And I despise the Eagles, mostly because so many of their fans are just nasty! Now it's time to get down to work, plan out my to-do list for the week, and start at least one load of laundry so I'm not rushing to pack at 11:00pm on Wednesday night. Here's to an easy Monday, right? Happy Monday, friends! For those of you who are off work (or even those who are working), I certainly hope you'll be participating in today's National Day of Service in honor of MLK Day. Every day is a wonderful day to give back in your community, but hands-on volunteering on a bonus day off can be so enjoyable when done with friends, right? 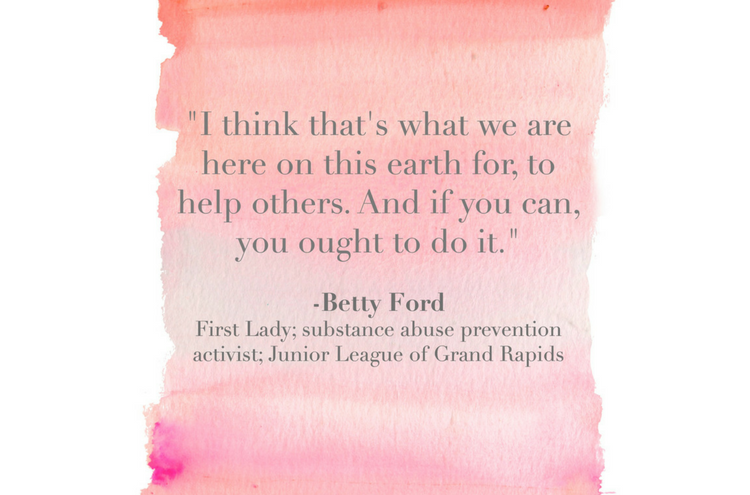 There are so many great reasons to get out there and volunteer! For me, I volunteer because I want to give back to this community I call home. It's so important that I do my part to ensure the Harrisburg area is a thriving community that allows all of its citizens to feel as welcome and fortunate to live here as I do. As anyone who knows me knows, most of my volunteering is done through the Junior League of Harrisburg, which is an organization so near and dear to my heart. In a time where everything feels like it's falling apart, being able to set aside time to volunteer each month makes me feel like the world isn't the pit of misery (dilly, dilly) that I sometimes imagine it to be. In addition to helping me put things in perspective, I can also gain valuable experiences that are not available at work, create friendships, and hone my leadership skills. Overall, volunteering - especially with friends - is something that I need for my mental health and sanity. So let's all get out there and put some good into the world today; don't you think it needs it? Currently Reading + Suggestions Needed!